Q: Why are purebred Fieldstone Charollais sheep better for birthing? A: Charollais lambs are easier to deliver with a narrower profile in their head and shoulders. Q: What makes Fieldstone Charollais lambs grow so fast? 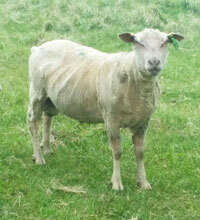 A: Charollais ewes are gentle mothers with superior milk delivery for their always hungry lambs. Q: Why are Fieldstone Charollais sheep better for butchering? A: Charolais sheep bulk up quickly with a high cutting percentage which approaches 60% and tender, flavourful meat.